Howdy. This is my entry to the 2015 edition of Review a Great Game Day. If you got here by Googling "Ys for DOS" or whatever I'd encourage you to pay them a visit. I'm not ashamed to admit I'm a huge fan of the Ys series. In the modern era that's OK, the series has grown in popularity in recent years. In the 80s & 90s it was looked upon less favorably. "Ys [pronouncing it like 'wise']? Isn't that some Zelda knock-off where you just run into the enemies?" was the typical opinion of that time. It's hard not to compare it to the Zelda series, both are in that fuzzy action-RPG space. Both feature a reoccurring sword-wielding protagonist who manages to find themselves completely unarmed at the start of each adventure. Both made a brief detour into the land of side-scrolling. Of course this is not the best version of Ys, arguments could be made for either the TurboGrafx-16 CD or PlayStation Portable version. While all the others have been reviewed dozens of times the poor DOS edition is collecting virtual dust. It's understandable, it's hard to find a legitimate copy and most people don't have a spare DOS computer laying around (although it runs fine in DOSBox and FreeDOS). Even as a fan of the series I put off trying it for years because I expected disappointment. Finally I gave in to my curiosity, I just had to know how this version compared to the others. The Basics: Ys stars Arick ("Adol" in most subsequent translations), an adventurer who arrives in a quiet town with seemingly mundane problems. There's some petty thievery in town - jewelry and a silver harmonica are both among the missing items. Arick is shortly called upon to solve something greater. 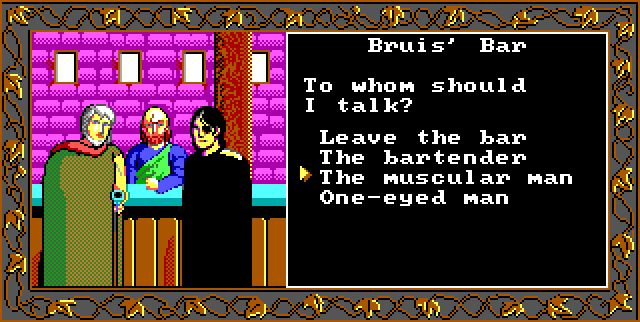 The local seer asks him to look for the ancient books of Ys. Something dreadful will happen if they're not found. Like any good adventurer he agrees and the action begins. Along the way he acquires a now standard assortment of items - weapon & armor upgrades, healing potions, and magic rings that boost attributes. Unlike later games there's no ability to sell unneeded items except for three minor treasures found in dungeons. Being an early game of this genre it's a fairly bare-bone experience. 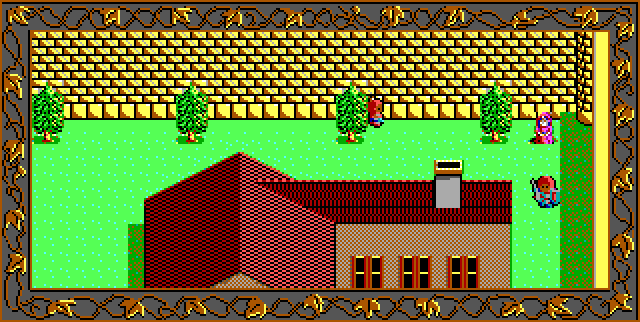 The order that the player proceeds through locations is linear with a tad of free exploration in the overworld. The dungeons are somewhat maze-like but definitely not overwhelming. It's a great introduction to the action-RPG genre, easy enough for anyone to play through. Controls: There's no tutorial required to get started with Ys. The arrow keys control Arick, the 'I' key opens the inventory menu, 'F4' opens the save game menu, and 'F1' opens the load game menu. There's joystick support too but I didn't try it. Talking to people is just a matter of bumping into them. Sometimes that can be annoying when trying to quickly cut through a town. While in towns Arick can enter buildings and interact with people, including buying items, through a a simple menu system. Fighting enemies is also just a matter of bumping into them. Well, there's a little more finesse involved than that... a head-on collision with an enemy will almost always damage Arick. He needs to strike them at an angle where only a small portion of the sprites collide. Perhaps Falcom was going for a mechanic where the player had to strike the enemy with the sword only. This seems crude to someone familiar with the Zelda games but it's very simple to learn and after a few minutes seems completely natural. Level System: Arick gains experience points and gold by defeating enemies. As the difficultly of enemies increases so do the rewards. When levels are gained Arick's hit points increase as well as his offense & defense statistics. There is a hard cap on the maximum level that is reached at about the halfway mark in Ys. Unlike other editions of the game, the experience points gained from enemies does not decrease as the player gains levels. In other versions, if defeating an enemy earns 4 experience points at level 1 it will only earn 2 at level 2 and 1 beyond that. This presumably done to prevent the player from reaching the highest levels until the very end. In the DOS version of Ys this decrease never happens enabling rapid level growth. Difficulty: Overall this is an easy game to complete with a gradually increasing challenge. There is one unbalanced spot though. 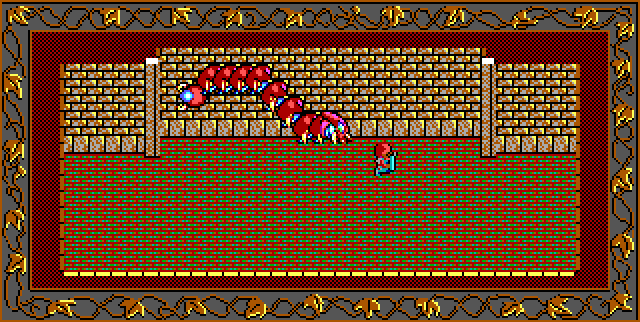 In the bottom floor of the mine level the enemies are unusually powerful. The weakest of them deal more damage than those found at the end of the last dungeon. Were it not for the ability to reach the highest level quickly this stage would be nearly unbeatable. It's an odd oversight in a game that otherwise is accessible to players of any skill. Fortunately the save system allows players to save at any time so one approach to conquering this difficult stretch involves saving every few feet. Boss fights can be challenging if entered at too low of a level. This naturally can overcome by spending a few minutes level grinding. 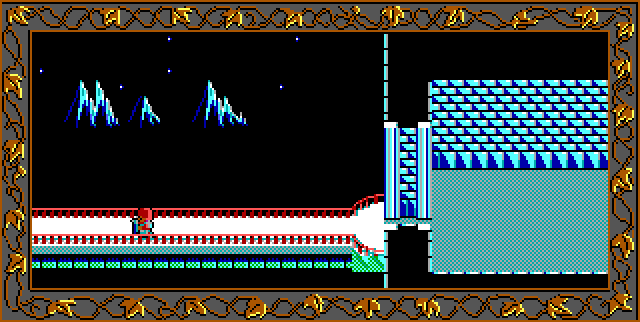 Toward the end of the game there are no more levels to gain so the player must gain an advantage by finding the most powerful weapons & armor which are hidden in the final dungeon. Story: The thing that makes Ys a great game is the story and the DOS version leaves it intact (minus name changes for every character). 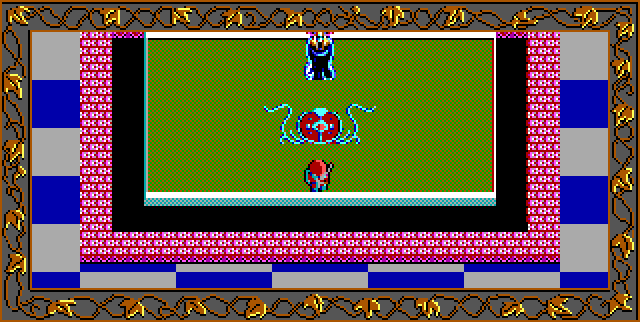 The game starts as a quest to find the ancient books of Ys in a palace and mine overrun with enemies. After clearing them Arick enters a 25 floor tower that serves as the game's final dungeon. In reality it accounts for about half of the total playtime and story. Arick isn't alone in the dungeon. Other adventurers ventured inside and are trapped. Some provide assistance while others need rescue, including a poet from the village who has been kidnapped. Arick does not proceed through the dungeon in linear manner. Floors needs to be revisited to solve puzzles or find items. At no point is it possible to leave the tower and restock on healing items. It is possible to rest & heal while traversing the staircase that wraps around the tower though. When the player finally reaches the last boss there is a feeling of accomplishment for having survived the challenges of the tower. How it compares to the other versions: I'm not going to get caught up on the graphics too much here. They look fine for the era it was released in. Obviously later versions look better thanks to stronger hardware. Likewise it's not fair to rank PC speaker music against CD audio. The biggest difference is the length of the game. Due to the previously mentioned experience point difference this is the shortest version. In all others some grinding is required but in this version the maximum level will be achieved without extra effort. Someone already familiar with the layout of the dungeons will wrap it up in around 4-5 hours. A newcomer might spend twice that much time. 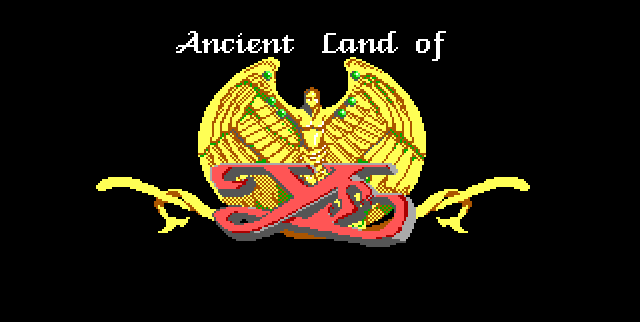 This makes the DOS version of Ys a quick way to experience the story. If you were to only play one version of Ys I'd first recommend either TurboGrafx-16 CD or PlayStation Portable version but can't not recommend this one for folks looking for a late 1980s PC gaming experience.